Dallying In The Dirt, Issue #264 - Sweet Summer Love, a new Clematis lighting up the summer. We left a son-in-law to water the containers and took off for a 4 day road trip. Cultivate 16, held in Columbus Ohio, is probably the largest green industry trade show in N. America. It is exhausting just to walk the exhibit hall, never mind trying to figure out which of the many lectures to attend. The real problem is going to a lecture because you are tired of walking the floor and then trying to stay awake during the talk. I don’t think I snored. Before we left we finally had some rain, actually more than some. In about 1.5 hours we got 6.0 cm (2.5") of rain. It did fill the rain barrels but most of it ran off the soil and carved great valleys in some of the paths. Too much, too fast but at least the rain barrels are full. You have heard me sing the praises of Begonia boliviensis many times. I tried a new variety this year, San Francisco, and it is as good if not better than previous varieties. I started them from seed late in January and had nice little plants to put out at the end of May. 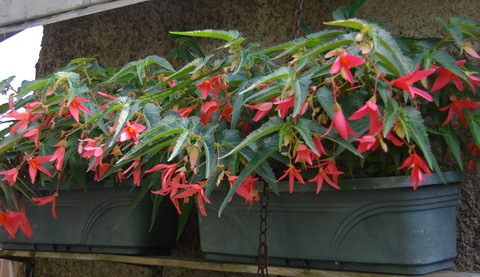 They have taken off during June and now cover much of the garage wall with their big, bright, salmon coloured blooms. They should continue to grow at this pace and stay covered in bloom until a hard frost knocks them down in October. If they are like other boliviensis types they should produce some significant tubers that we can keep overwinter to get even larger plants next year. I may also try to collect some of the abundance of seed that they produce. Out in the front yard where the, road building, backhoes and bull dozers keep getting closer to my gardens, there is a new delight. Last year the fine folks at Proven Winners sent me a tiny new Clematis called Sweet Summer Love. It is a purple flowered variety of Sweet Autumn Clematis Clematis paniculata that also blooms much earlier. It stayed in the soil and looked at me for a year while it established some deep roots and this year it took off like a true C. Paniculata. 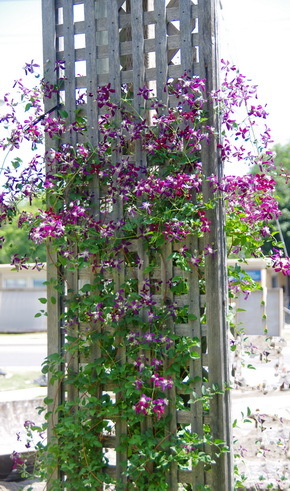 The trellis is covered with small purple blooms that have a wonderful sweet fragrance. They should continue to grow and bloom well into the autumn. It can get a bit large but we will prune it close to the ground next spring to keep the new growth, that bears the flowers, on the trellis. That trellis is about 2.5 m (8') tall and it’s almost entirely covered with bloom. It also tolerates some shade so I may try one on some of the trellis around the deck where the regular Clematis are not exactly thriving. The new drip irrigation system that went into the Asparagus beds a few weeks ago has been very timely. Those beds are also filled with several varieties of Daylily. They have been watered twice as they were developing and now those beds are just a mass of colour as the Daylily season swings into full bloom. The difference between the watered beds and those that are still suffering from our drought is quite noticeable. Bigger blooms but also many more buds on the scapes that will keep us in Daylily blooms for most of the summer. 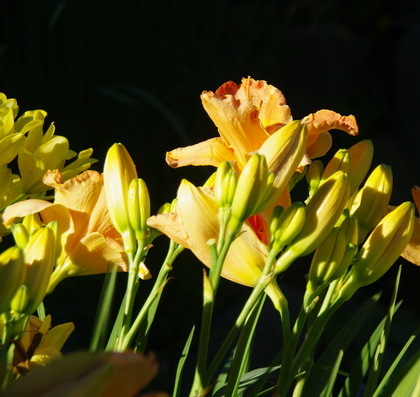 That is the true value in growing Daylilies. They bloom in mid summer when not many other Perennials are putting on a show and they continue to do so for several weeks. I am fascinated by the ability of some weeds to germinate and grow in soil that resembles a pile of dust. Amaranthus retroflexus which I know as redroot pigweed is growing beautifully on the patch of bare soil where we are slowly renovating the turf area. Clouds of dust come up as you walk across it but the Amaranthus are now over 30 cm (12") tall and I have started pulling them by hand. They are one of those nice weeds that easily pull out complete with their roots. There are a few Amaranthus species that are grown as a grain crop and if they are as adaptable to tough conditions as these then you can see their value in more difficult climates. Colette Asks? I need your help! I have small yellow striped beetles devouring my cucumber and zucchini plants. How do I get rid of them? Also, can you please remind me what the ratio of milk to water is for powdery mildew treatment. Ken Answers! You have Cucumber Beetles. I don't this year so don't give them my address. They can be killed with insecticidal soap if you directly hit them. I found them clustered inside the flowers early in the morning and was able to attack them there. The powdery mildew treatment is 1 part milk to 9 parts water. Juliet Asks? I'm concerned about my tomato plant. I have 2 varieties planted in a knob hill box, (yes, saved them, knew they would come in handy some day). The yellow cherry tomatoes are doing great, but the fruit on the 'Health Kick' appear to be rotting on the bottom; they are the size of a cherry when the brown bottom appears. Ken Answers! You seem to be describing, blossom end rot. Usually a calcium deficiency. I plant mine with a spoonful of powdered milk to prevent that. At this stage probably try mixing some in the soil or just mixing it with water and pouring it on. Ground up "Tums" should work as well and can be easier to find and cheaper.